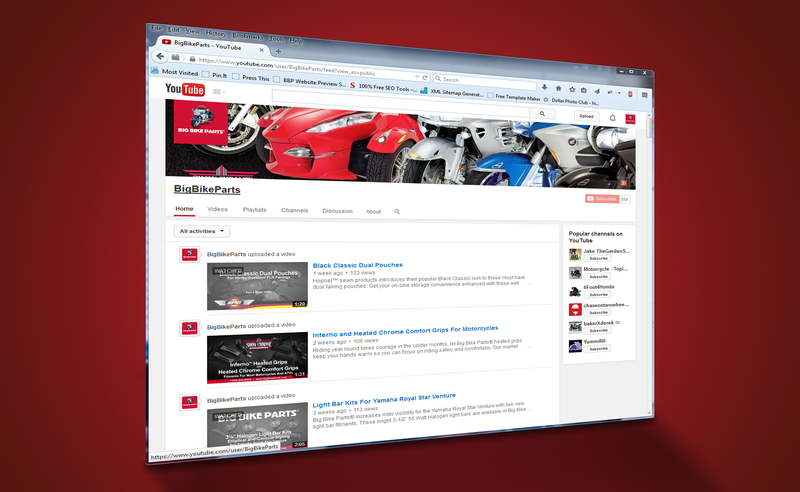 Rice Lake, WI – Big Bike Parts® has released over 125 videos on YouTube, reaching more than half a million enthusiasts. Big Bike Parts® is dedicated to ensuring consumers and dealers can view all of their new products and has taken steps to ensure no new part is released into the marketplace without an accompanying video. Big Bike Parts® videos provide an introduction to new parts, showing you a three dimensional view of the product and where it is installed on your bike. These videos can help you better understand where new products go, how they are intended to fit and may give you installation tips. We also explore different variations to parts, chrome, smoke chrome, anodized black, and let you know what other products work with, or compliment a particular fitment. The internet is a great place for consumers and dealers to research and discover new and upcoming products. See first-hand as we dive into our new product releases and display them on your favorite motorcycle. Big Bike Parts® also thanks its many dealers and their extraordinary service centers, especially those that have contributed by uploading installation videos on our products. These videos are invaluable to consumers and help build dealership awareness and loyalty. So the next time you’re considering a new piece of chrome or some other gadget for your motorcycle, for yourself or to stock in your dealership, come online and see what we may have available, you never know what you might find! From product overviews, to complete in-depth installation videos, the world (wide web) is your playground.